South Korea’s highest ranked tennis player Chung Hyeon has been seeded 26th at Wimbledon, the oldest and most prestigious tennis tournament in the world. The All England Club announced seeds for 2018 championship on Thursday. Among 32 players seeded in Gentlemen’s Singles, the South Korean was seeded 26th. In Gentlemen’s Singles at the Championships, 128 athletes compete for the silver gilt trophy and 32 of them are given seeds with the intention to keep the best apart until later in the competition. Before the “Professor,” no South Korean tennis player has been seeded in Grand Slam tournaments. 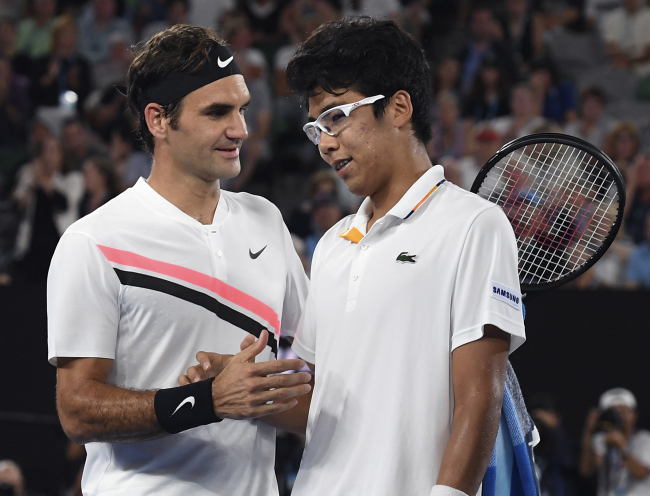 While he was set to be seeded around 20 during Roland-Garros, also known as The French Open, Chung opted out of the tournament due to an ankle injury. The Australian Open semi-finalist was due to play Rafael Nadal, Roland-Garros Champion, at the Aspall Classic but he again decided to pull out from the event for rest. The Swiss maestro Roger Federer, who eyes his ninth title at the All England Club, was named as the top seed, while Nadal was seeded second despite being the current World No 1. The main draw of Wimbledon is scheduled to kick off next Monday.